I have been using Amazon’s Elastic Beanstalk for deploying Java applications for some time now. I find it is a perfect solution as it is simple to use and takes care of load balancing, server instance management and all the low level maintenance that is necessary but tedious to perform when running scalable, high availability applications. As a software developer, a Platform as a Service (PaaS) such as this really does enable you to focus your efforts and energies on building great applications. In the Java world Beanstalk allows the deployment of any standard Java Web application to the platform as a war file. Applications deployed are available within minutes. One of the features of Beanstalk is that it monitors the application instances using a health check URL and if the instance does not respond will start another instance, terminating the non responsive one. If you are a developer and are interested in how PaaS may be used for deploying your applications, check out Learning Tree’s Cloud Computing curriculum. The introductory course covers all aspects of Cloud Computing with a significant section dedicated to PaaS, detailing what to expect from PaaS as well as what the major vendors such as Amazon, Microsoft and Google provide. Two hands-on exercises together with instructor led deployments to the cloud highlight the business and technical benefits of PaaS. Hopefully I will see you there soon. It may or may not be widespread knowledge but Microsoft has been quietly supporting open source for years. Many people continue to think of Microsoft as a company that sells proprietary software. They certainly are that but they are also involved heavily in open source. They do not, in my opinion, get enough credit for their efforts there. PHP is a technology that is popular with the open source community. There are many freely available applications written in PHP that could be incorporated into a cloud based solution. With the latest release of the Windows Azure SDK for PHP and the Windows Azure Tools for Eclipse it is easier than ever for programmers to deploy their PHP applications to the Azure cloud. The SDK gives PHP programmers a set of classes that can be used to program against Azure storage (blobs, tables and queues) and Service Management. There are also additional SDKs for App Fabric and OData as well as drivers for SQL Server. The Eclipse tools offer an end-to-end solution that enables the developer to program, test and deploy PHP solutions onto Azure. Version 2.0 of the Eclipse Tools (developed by Soyatec) was announced at PDC10. This version offers many new features including integration with the Development Fabric, support for Worker Roles, MySQL integration and deployment from within the IDE. In addition to the SDKs, drivers and Eclipse tools there is also support for the command line developer to leverage scripting skills in deployment of existing PHP applications. Finally, there is the Windows Azure Companion which makes it pretty easy to deploy finished open source community applications (such as WordPress, SugarCRM, Drupal and others) onto Windows Azure without having to know a lot about the underlying details. The following screencast demonstrates creating a PHP Azure application from within Eclipse. 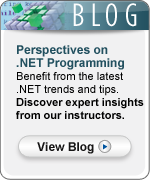 To learn more about Windows Azure consider attending Learning Tree’s Azure programming course. For an introduction to PHP you may like to come to Introduction to PHP for Web Development.